About once a month, my sister and I take the opportunity to spend quality time together with a visit to Wasabi Japanese Sushi. Located in Brooksville, the sushi chefs know us as regular visitors. The staff is always very friendly and the food is very tasty. We are the typical customers who like our sushi "Americanized". We love our rolls to include eel sauce, cream cheese, avocado and spicy mayo! 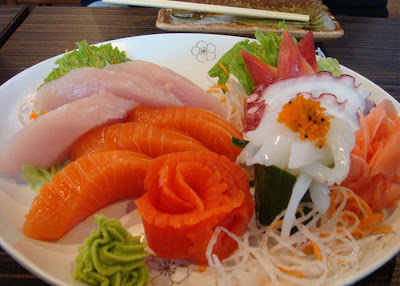 However, when ordering traditional sushi, Wasabi's sashimi is always fresh and delicious! My sister, Rachel, was ready to venture out this visit and try sake. You can order sake warm or cold, sweet or dry. If you haven't experienced sake, you have to try it! Sake is created by fermenting rice. On this day, we went with the Takara Sho Chiku Bai Sake Nigori. It is a silky sake with a sweet, rice flavor. Rachel was pleasantly surprised with the Nigori sake! Below is a video to help you pick out a sake that you will love. We always prefer sitting at the sushi bar. If you have not done this before, you have to try it. You can watch the talented sushi chefs make their creations. Many times, when you sit at the sushi bar, it is tradition to provide the customers with a free tasting. Our tasting was Sunomono. Sunomono is kani, tako & shrimp wrapped in sliced cucumber with sweet vinegar. It is a delicious, low-carb appetizer. Rachel and I always get one roll that we absolutely love, the Pink Girl roll. The girly girl in us can not resist this sushi rolled in pink paper! The Pink Girl roll includes shrimp tempura, cream cheese, spicy crunch tuna, masago with eel sauce and spicy mayo. For our second roll, we try to get something new every time. We ventured out and tried the sushi cake. You have to love tuna, fresh salmon, kani, avocado, scallion, caviar, crunch, eel sauce and spicy mayo. And it is topped with a cherry! Cheers to good times and good food! choices. If you are on a budget, Wasabi provides reasonable lunch specials. Wasabi provides a quality atmosphere and is always very clean. Visit Wasabi Japanese Sushi next time you are in Brooksville! I just bookmarked this blog!Thanks for sharing with us!